This is the directory on the server where Exordium can find all your music files. There can be various mounts underneath this directory (network or otherwise), but all music files must be underneath here somewhere. Note that even though Exordium will never attempt to do any write operations on the library, it’s best if the user running Django does not have write access into this directory, anyway. This is the URL which provides direct web access to the files contained in the library base path, above. This will most likely be a static directory configured in Apache or whatever other frontend web server is in use. Technically this option does not have to be specified for Exordium to work, but track downloading and music streaming won’t work unless it is. For full-album downloads, Exordium will create a zipfile on the filesystem and then give the user a link to that zipfile. This option specifies the directory in which the zipfile will be written. This is the only location on the filesystem where Exordium requires any write access. If this option is not specified, the button for album zipfile downloads will be hidden. Similar to “Exordium Media URL” above, this is the URL to the zipfile generation path, typically configured via Apache or whatever the frontend webserver is. Without this option, the button for album zipfile downloads will be hidden. 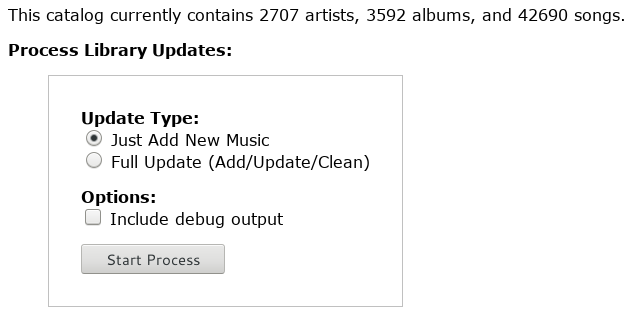 Most of the time you will just be interested in adding new music to the database, so keeping the defaults and hitting “Start Process” is all you need. If there have been changes to existing files on disk (or if files have been deleted, etc), then you can use the “Full Update” option to do a full comparison of the database to the on-disk state. In practice there isn’t much difference between the two options, speedwise, even though the update option technically does more work. The “Full Update” will also re-scan for album art, for albums which do not have album art already. The checkbox to “Include debug output” can be used to include more information about the update process as it proceeds, though in general there isn’t a need to do so. If you encounter problems during the update, it would probably be nice to have that option turned on while investigating/reporting the bug. Note that the initial load of a largeish music library into Exordium can take quite awhile. On my system, a library of 42,000 tracks takes about an hour to do the initial add, the majority of that time spent looping through the filesystem computing checksums of all the tracks. Exordium uses SHA256 for its checksums, and while SHA1 or MD5 are faster, and would probably be sufficient for our use, on my system this process is primarily I/O bound, and using the faster algorithms don’t actually provide any significant speed increase. This is just a convenience link to the main Django administration area. In general, there is unlikely to be much need to edit Exordium objects from inside the administration area, but it might be useful in some circumstances to tweak values manually in there.